Israel court orders closure of building at tense Jerusalem holy site - SABC News - Breaking news, special reports, world, business, sport coverage of all South African current events. Africa's news leader. The Jerusalem magistrates court said the Golden Gate mosque should be closed while the case continues. The Jerusalem magistrates court said the building known, as the Golden Gate at the Al-Aqsa mosque compound, known to Jews as the Temple Mount, should be closed while the case continues. Waqf spokesperson Firas Dibs said it did not intend to abide by the court’s decision, adding that the building remained open on Sunday. Jordan, the custodian of the holy site, condemned the court ruling, with its foreign ministry adding that Israel would bear “full responsibility for the dangerous consequences” of the decision. There are believed to be discussions on-going between Israel and Jordan over the status of the building. There have in recent weeks been scuffles between Palestinian worshippers and Israeli police at the site in Israeli-annexed east Jerusalem over the use of the side building. Israel shut access to the Golden Gate in 2003 during the second Palestinian intifada over alleged militant activity there. Palestinian officials argue that the organisation that prompted the ban no longer exists and there is no reason for it to remain closed. The larger compound is the third-holiest site in Islam and a focus of Palestinian aspirations for statehood. It is also the location of Judaism’s most sacred spot, revered as the site of the two biblical-era Jewish temples. Jews are allowed to visit, but cannot pray there and it is a frequent scene of tension. Israeli officials are concerned tensions at the site could boil over and set off wider clashes ahead of 9 April Israeli elections. Ofer Zalzberg, a senior analyst for the International Crisis Group, said “we are seeing a hardening of the negotiating positions of both sides” concerning access to the side building. However, the court order gives the Israeli authorities some leeway in enforcement, he said. “The court did not give the police a deadline for implementing its order. It introduces clarity, and now it’s at the discretion of the government in terms of the timing and manner of the enforcement,” said Zalzberg. 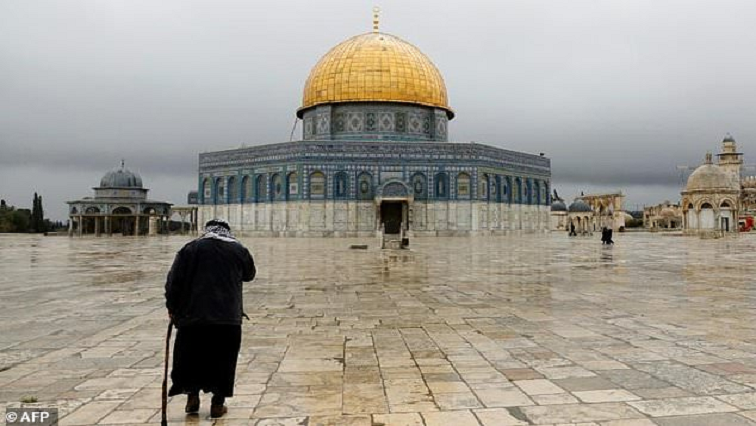 The Waqf said in a statement on Saturday that it wants to carry out renovations at the building, but keep it open during that time for Palestinians who wish to pray there. It alleged that far-right Israelis were seeking to take over the side building, but Israeli authorities say they are committed to enforcing the current rules in place at the site that prevent such moves. This entry was posted on 17 Mar 2019,08:45PM at 8:45 PM and is filed under mobile-leadstory, World. You can follow any responses to this entry through the RSS 2.0 feed. Both comments and pings are currently closed.